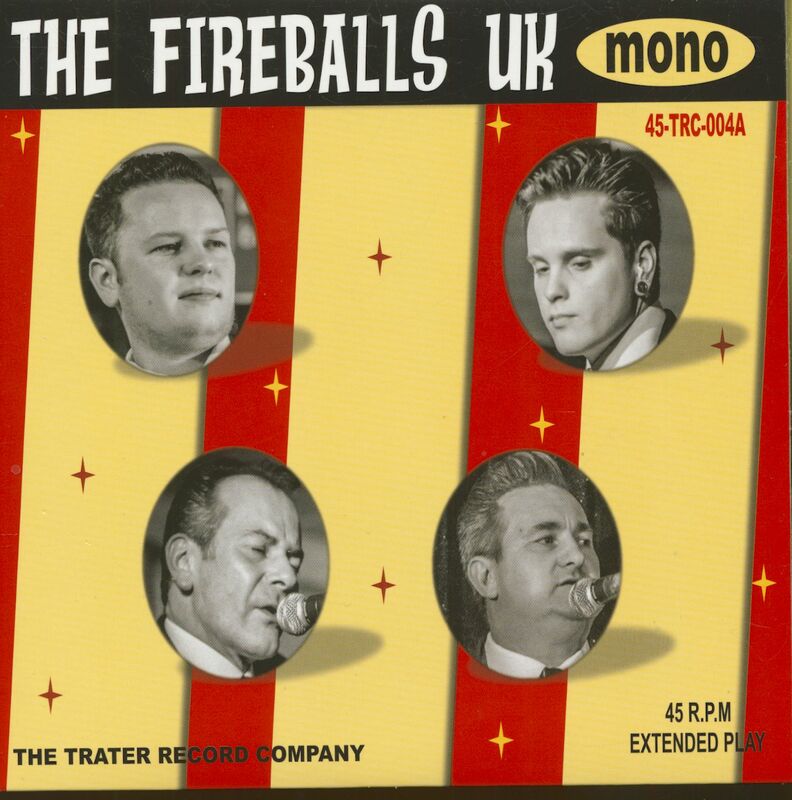 When promoters are describing a band as "British Rock n Roll at its best" it opens our ears here at TraTer Records. The reason? There are simply not enough bands who cover the genre of music that we love let alone produce it so well. 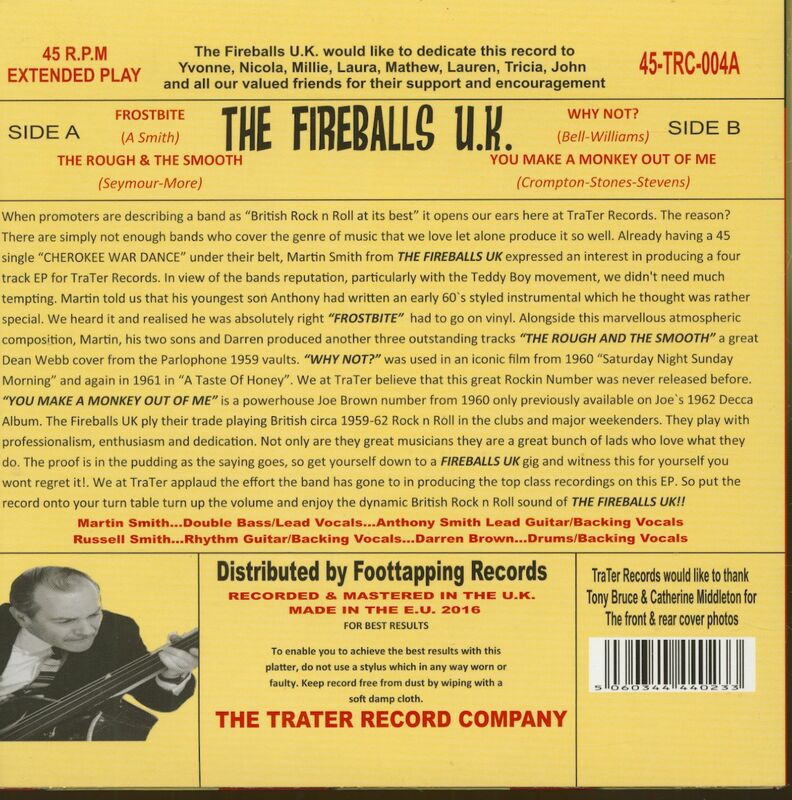 Already having a 45 single 'Cherokee War Dance' under their belt, Martin Smith from The Fireballs U.K. expressed an interest in producing a four track EP for TraTer Records. In view of the bands reputation, particularly with the Teddy Boy movement, we didn't need much tempting. Martin told us that his youngest son Anthony had written an early 60's styled instrumental which he thought was rather special. We heard it and realised he was absolutely right 'Frostbite' had to go on vinyl. Alongside this marvellous atmospheric composition, Martin, his two sons and Darren produced another three outstanding tracks 'The Rough And The Smooth' a great Dean Webb cover from the Parlophone 1959 vaults. 'Why Not' was used in an iconic film from 1960 'Saturday Night, Sunday Morning' and again in 1961 in "A Taste Of Honey'. We at TraTer believe that this great Rockin Number was never released before. 'You Make A Monkey Out Of Me' is a powerhouse Joe Brown number from 1960 only previously available on Joe's 1962 Decca Album. 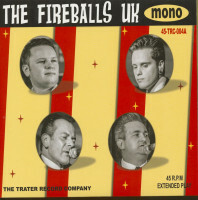 The Fireballs UK ply their trade playing British circa 1959-62 Rock n Roll in the clubs and major weekenders. They play with professionalism, enthusiasm and dedication. Not only are they great musicians they are a great bunch of lads who love what they do. The proof is in the pudding as the saying goes, so get yourself down to a Fireballs U.K. gig and witness this for yourself you wont regret it!. We at TraTer applaud the effort the band has gone to in producing the top class recordings on this EP. Customer evaluation for "The Fireballs U.K. (7inch, 45rpm, EP, PS)"